This is the year that I shall get a rhubarb patch. Finally I have a spot selected where this perennial might flourish and not get eaten by the sheep. The sheep do not seem to be deterred by the oxalic acid in the leaves even though they are poisonous. The leaves can be soaked to make a bleaching agent. People should never eat them. The stalks do not contain the compound. 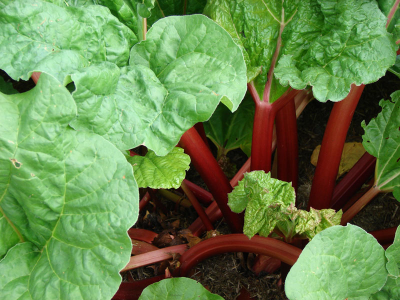 Rhubarb needs good sun with some protection from drying-out; a rich, well-drained soil, and to be placed where it can grow undisturbed for years and yet be close enough for the gardener to gather the nutritious stalks. 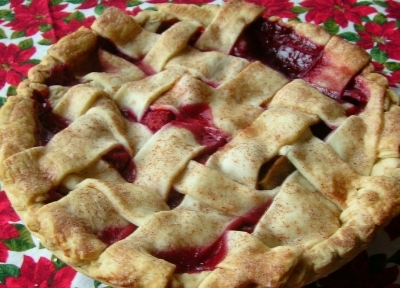 Rhubarb is a storehouse of essential minerals, and while tart, there is nothing better than this vegetable to make a pie, sauce or conserve for balancing the “bad” sugar with such a high source of calcium and potassium. Its roughage has long made it a staple of “spring tonic” cleansing. A stalk lightly salted is one of the memories associated with the joys of the spring season, which every child should try. It freezes well for cooking. Bolting, or the perennial’s need to flower, is a problem that can be attacked by simply removing the flower stalks as they start to come. After a while the plant decides that it will stop the effort but it seems that warm soil puts it in reproductive mode. Newer cultivars like Canada Red and Valentine tend to bolt less than some of the older ones like Victoria and MacDonald.Often pots sold do not identify what cultivar it is and it is hard to judge if you will get a large- or slim-stalked variety. Rhubarb grown from seed will not necessarily be like the parent and may actually end up as an errant child with none of the characteristics you want. Here in NE there is a preference for red stalks, but they can be red, pink or green. There is little difference in flavor. Early production and thin skin are also two characteristics to consider. The idea is to find someone you know with the plant that has the color, stalk and hardiness you want and beg or trade for a good slice of the original plant with its roots intact in its ball of soil. When ready to plant, a good hole with compost and proper drainage should be waiting. Plants are influenced by their environment and they still may show some variations from the original. Large plants should be treated like all perennials, dividing the crowns every 4-5 years, but they can go much longer. When harvesting, enough leaves should be left for the plant to store carbohydrates for the next season. It is a good idea not to take more than 1/3 and to stop harvesting by the 4th of July. Some people cut and others pull. There are spore-bearing disease agents that are more easily introduced by cuts. A layer of peat moss is reported to discourage disease. Rhubarb is a heavy feeder. The soil must be kept healthy. I will have to beg or buy this year’s crop and may only have a little produced next year but I can already anticipate a plot that will produce for years to come. I imagine introducing my baby granddaughter to the delights of a freshly pulled stalk, leaves carefully removed, and a dash of salt which will rival any jarred pickle for sheer sour joy.